The development of the Telstar satellites marked the dawn of the era of worldwide satellite communications. Telstar 1, launched in July 1962, and Telstar 2, which came ten months later, were engineered by a team at Bell Labs headed by John R. Pierce. 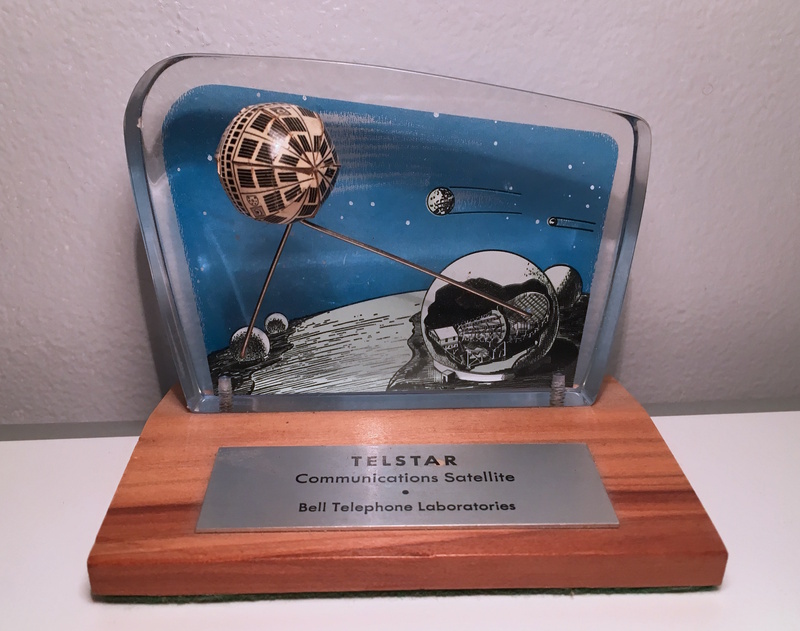 Covered in some of the first examples of photovoltaic solar panel technology (another Bell Labs innovation), both Telstars were equipped to handle transatlantic data communications, including early satellite television, telefax, and wireless telephony. This commemorative paperweight/desk ornament features a three-dimensional satellite bursting free of the lucite plane of “outer space.” Down on Earth, spherical domes (situated in Andover, Maine, and Pleumeur-Bodou, France) containing microwave horn antennas receive and transmit the transatlantic satellite signal. After Telstar 1’s first test transmission between Maine and France on July 11, 1962, the era of transatlantic satellite transmissions began with an eclectic joint television broadcast between Europe and the U.S., which contained announcements from newsreaders on both sides of the Atlantic, part of a major league baseball game at Wrigley Field, prepared economic remarks by President Kennedy, live cut-ins from the World’s Fair in Seattle, a Shakespeare festival in Stratford, Ontario, and mission control at Cape Canaveral. This demonstration in transatlantic satellite television recalls a famous surviving broadcast from the early days of American radio, the National Defense Test Day on September 12, 1924, when the still-forming nationwide radio networks came together to assist the War Department in a demonstration of the mass communication power of radio technology for civil defense. Telstar entered the pop culture lexicon thanks to these early demonstrations and broadcasts in 1962, with the name becoming an eponym for all satellite technology. British pop group the Tornados had a space/surf rock instrumental hit with “Telstar,” which went to the top of the charts in both the U.S. and U.K. in the latter half of 1962. “Telstar” features prominent use of electronic instrumentation in the form of an early synthesizer. This plaque was presumably made as memorabilia for a worker on the project at Bell Labs; it was purchased by the author at the Brimfield Fair in Brimfield, Massachusetts, in 2015.